Last night I was craving something healthy (I never thought the day would come in my pregnancy when I would say that! ), so I decided to spruce up an old classic. 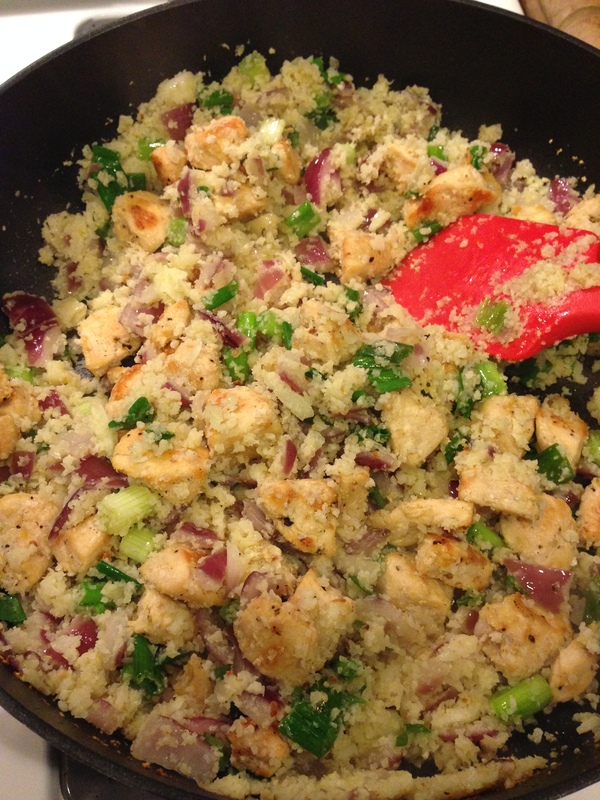 I took my original Cauliflower Fried Rice recipe, added some chicken to it, and tweaked some of the ingredients. Let’s get started! For this part, you can refer to my original post, as I pretty much prepared it in the same way, except this time, I sautéed the garlic last. So, after cooking your red onions, add your green onions, then add your garlic. Since garlic burns quickly, I felt it would be best to hold off on cooking it until the end. I also sautéed the chicken in a separate pan for about 15 minutes until it turned golden brown. 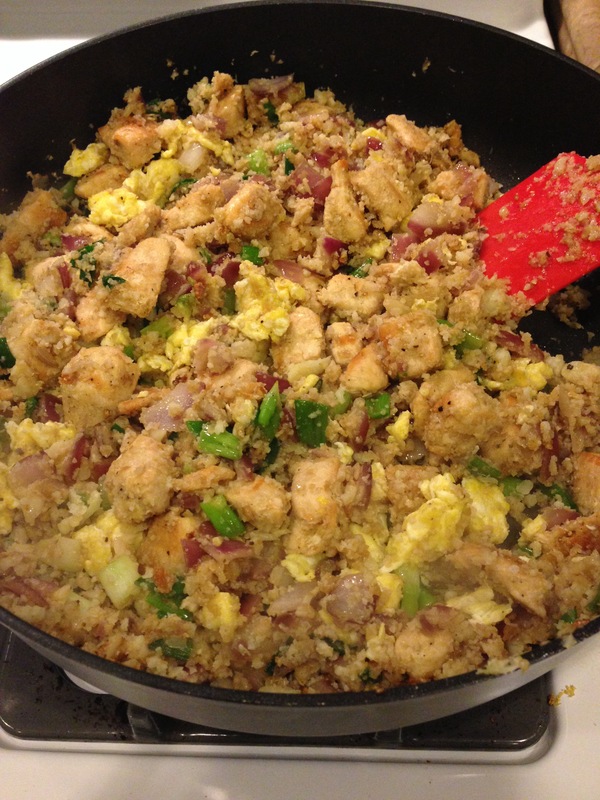 Then, I added the chicken and eggs to the cauliflower fried rice last, after I had added the final two ingredients of soy and Worcestershire sauces. The end result was a delicious, satisfying, and completely guiltless meal. The chicken was a nice touch, as the protein helped keep me full longer than usual. And, I have to add that even if you don’t like cauliflower, you will like this dish because once you sauté the cauliflower, there is no real cauliflower taste. The cauliflower acts as a nice substitution for rice without the calories. I’m going to try this someday! My boyfriend hates vegetables, so this is a great way to sneak them in! Please let me know how he likes it if you decide to make it. I agree that it’s a great way to sneak in some veggies; this dish is so savory that you don’t even realize you’re eating healthy food since it tastes so good. Thanks for stopping by, and Happy New Year to you!